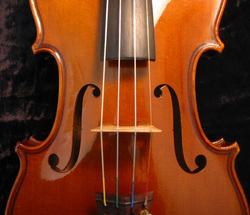 Your child's instrument and bow need to be well cared for so that they keep their value and so you can avoid costly (and unnecessary) repairs. The general rule is that if you are comfortable, then the instrument is comfortable. Please never leave instruments in the car or in a hot attic or cold basement. Just like the tires on your car, instruments also experience wear and tear over the year. Please be sure to replace the bow hair and strings every six months. At that time please also have the shop do a visual inspection to make sure there are no other repairs needed.